@Blood1991:He said it himself on panel, it was his wife or his country. Sparring(I don't seem to recall them fighting each other in the past) and actually fighting someone is two very different things, Blood. He may be willing to show her a few moves but that is no indication to believe that he would be willing to deliberately KO his own wife. As for him never attempting to talk it out, that is something that has been talked about since the beginning of this event. For some reason he wouldn't or couldn't tell her the reasons he was so willing to side against the X-men in AvX. You are asking the big questions that have yet to be answered. He did a falling chop? Or are you talking about the editorial mistake in UXM, where it was revealed to have never happened? I think the reason it looked like he was getting whooped bad is because he wasn't really dishing out any damage of his own. He was defending himself from her full h2h furry and you can't really expect him to be able to block every single one of her attacks. She's too well known at being very crafty when it comes to h2h, even with people who are much faster and experienced. Woah, you're making a thread about the feasibility of mutants powers under the laws of real world physics. Hmm re-reading it I realize I fused some of the events in World Apart in my mind. I still think him holding back is bull, but he was only defending himself. I think he was handled poorly in the confrontation regardless. If he wasn't willing to talk he should have been willing to put his dukes up. @Blood1991:Ah I see now(I kept thinking, how could I forget something like this? lol). @Storm Calling: Lol I though she kissed him the punched him in the face, but it seemed mutual. The whole fight was weird :/. Meh it's over now. Yeah I don't think it really had to come down to that either, but I'm not surprised that it did, considering they wouldn't have her husband explain things to her for some reason. Read Science of the X-men, he's not the first one who has tried to do it. I have. It's an awful, awful book. Most of the stuff in there is bullsh!t i.e. not related to anything that's happened in cannon. Pure fan fic. Well she could have waited for Cap to brief the situation before storming "Yay puns" out too. Looking back everything about their marriage was handled like sh!t start to finish "excluding Mcduffie's work on the Fantastic Four". I am however curious about A+X when they team up. Both to see how the can f__k it up further and how they poorly explain the plot holes in their divorce. The Cyclops chapter was literally the worst thing I've ever read. That's the only one that I haven't blanked from my memory, probably because it made me so damn mad. This was eight years ago. I agree 100% though that it was handled absolutely atrociously. I'm just glad it's over and I hope they aren't planning anytime soon to bring the pair back together. But if I could just add: this was such an amazing read! I'm sure all of us here were aware of the feats that Storm has accomplished, but to learn in-depth of the nature of her power -the specifics (for lack of a better term) - was truly awe-inspiring. @redhairedphish: Lol when worlds collide moment right here. @Blood1991: Omg, right? How crazy is this?! I figure, "what the hey, I'm here, I might as well contribute." Ha, it might not be as awesome as in-depth analyses or awesome scans, but at least I still have my two cents! @redhairedphish: I'm working on graphing her relationships at the moment as my contribution, but I don't think I can top this or the Bloodline thread. Everything was wiped by a glitch or something so we are rebuilding. The user you spoke of his still a thorn in our side, but we do our best to prove we aren't all nuts. @jhazzroucher: Thanks. Really, thanks. But um... I'm not technically new. I've had this account for a while and only now decided to start posting. Remember the iPhone case fiasco where Storm art was being used without permission? LMAO...this was the scene befroe she started beatin' peoples a$$e$ lol. That old lady with the flower pots talkin' 'bout "Bring it b$%^#es" damn near made me wet myself. - Storm's lightning is not exactly the same as real word lightning and can contain high degree of concussive force? - Ability to create her own EM, electric, electrolysis and ionization fields? - Defensivve use of thunder? - Wield her powers to control air and pressure gradients in the body? - Altering the state of water at a molecular level? LOL! You gotta love Rasputia! :p and yes I remember her fight with the towns people, it was pure gold! As for the feats, yes, I think we should get into several of those in detail, especially the concussive force lightning and her defensive capabilities with air pressure gradients. Are you guys going to put something in about her using her powers to scramble psyic energy? I'll be adding that to my next update soon. Can wield her powers so acutely that she can manipulate the air in a person's lungs. Manipulating the air pressure inside BP's inner ears. This adds to the explanation of her lightning intensity control and impact force more than it being a feat. Storm has shown that she can control the yield, heat intensity and force of her bolts. In the first 2 scans Storm created a concentrated ball of lightning that detonates or expands out, KO'ing all 6 of attackers simulatneously with concussive force. The impact force of Storm's lightning strikes Bishop hard enough to knock him into a vehicle (obviously weighing tons), and the impact force is great enough to send both him and the vehicle through a wall and into the back of a building. The impact force of Storm's lightning knocks Thunderbird off his feet and into Magik, and instantly KO's Psylocke, and practically knocks her clothes off. B)So this is why Psylocke decided to start wearing a bikini. 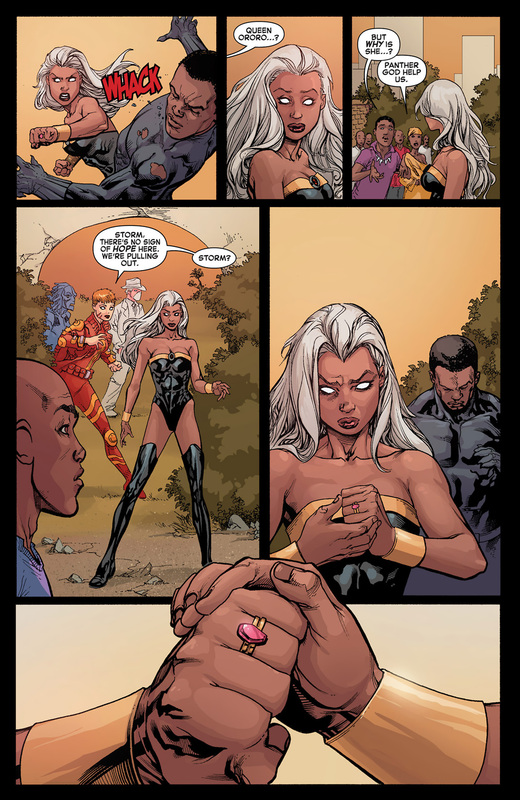 @Son Of Storm: From X-Men: Black Sun #2. Storm was possessed by Ngairai and went HAM on Psylocke and Angel. Lol...the minute Psylocke decided to dress approrpriately Storm goes does and this ish and ends up exposing her a$$ anyway. Before the scan Magik entered Earth through one of the stepping disks and tells everyone to take cover before it is too late. "Storm" comes along yelling, ‘It is found, it is ours!" then strikes the ground with lightning. Thunderbird asks her if she has gone nuts and she replies with another bolt of lightning to the ground which sent Thunderbird into Magik, and knocked Betsy completely out of the game. The only one two escape was Archangel but even he couldn't fly against a flash freeze. The only thing that stopped "Storm" was Pilgrimm, who she was stomping before a surprise attack. I MUST FIND THESE ISSUES! I think Matt Fraction should of read that. He can write a fanfic.....just to see if he actually understand what he's talking about. Many may not know that Storm's ability to command the energy systems of an atmosphere also involve controlling the forces that pattern and factor the weather, such as heat, moisture, electricity and of course, air. This somewhat gives her the ability to channel and manipulate some of the factors of the weather directly. We have observed Ororo manipulating hydrogen atoms, electrons, and air directly. As well as alter the state of water into all of it's forms at command(from gas to liquid, liquid to ice and vice versa for example). Other examples include when was shown controlling wind with enough precision to levitate a single pebble to pick a lock, nabbed an unsuspecting Kitty Pryde from within the X-mansion and brought her several miles into the sky with her, so that they could have a private meeting. Or when she tagged the Blackbird in New York while being stationed in Wakanda at the time. She has even created a hyper-ionized patch of air inside of a digital camera to erase it's memory. This control can be applied to the human body as well, such as controlling oxygen levels in the lungs and manipulating pressure within the inner ear. She has threatened to run lightning through a persons insides(ouch), and has shown that she can drop the internal temperature of a gun -200 degrees after it had been fired and before the trigger could be pulled. Looking at this from a different perspective, this applies as well to her ability to produce effects that have not existed on Earth naturally, such as when she produced a Jovian pressure field with more pressure than is found on Jupiter to contain a small scale nuclear explosion. As long as she has the resources and strength, it can stand to reason that it would apply to many other effects. I would like to get into a bit more detail later with how this applies to her normal manifestations of her powers, such as when she produces storms or blizzards without affecting other areas, and the rules that she follows. Lightning usually only produces a shockwave as force when it strikes, but that is not all that Storm's lightning has been shown to do in the past. Looking at her powers from a general explanation, it was stated that she could manipulate both force and energy. Considering this, it is most likely the reason she has been able to apply force with her lightning, such as was the case when she blew a huge hole from the bottom of the sewers into the city streets, or when she smashed through rock and stone with it's force, created an electrical bomb explosion effect, destroyed the X-jet and other heavy metal objects, as well as have sent many of her opponents flying back with extreme force(enough to KO). They have even been used for defensive purposes as well, such as when she blocked a concussive force blast from Cyclops, detained a leaping Panther into a lightning force cage, or deflected Gambit's kinetically charged cards. The first being her willpower. This came after several encounters with Emma Frost, who had come to be one of Ororo's deadliest foes before she eventually joined the X-men. Emma defeated her twice(though both were ambushes) with her telepathic powers, but after she switched bodies with Storm, and Ororo fully comprehended the way telepathy worked, she was able to best Emma in combat. Establishing for the first time that Emma would never dominate her mind again or anyone else. Since then, Ororo's will grew even more, all the way to a point where her indomitable will was being compared to the most powerful minds on the planet. Charles Xavier himself and Magneto(whom's will is second to none). Examples include when she withstood the combine power of Professor X, Psylocke, and Oracle in Warkull, who attempted to use their powers to destroy her and the X-men; When she fought Dracula's powerful mental hold over her, due to his shared mystical vampire blood within her; As well as when she resisted Malice's possession while being powerless. Considering that notion, it makes since to apply this to her ability to wrest control of other elemental controllers, such as Hydro-man with his water form, Blitzkriegs' electricity control, Amelia Voght's mist form(her movement), Shaman's blizzard, Hurricane's wind control, Living Lightning and Stardust's electrical forms, and bested the Trion in their own element. It also applies to her ability to disperse powerful storms. Her strength of will has always been quite strong. It could have been that she simply didn't know how to apply it against telepaths until she became one herself after switching bodies with Emma Frost. Her second defense to telepathy is the increased electrical activity in her brain, described as static. This is a passive ability that wasn't applied until her run in X-treme X-men, when her best friend Jean tried to have a taste of her ice cream during a telepathic meeting. Jean stated that she was unable to taste the ice cream because there was too much static in her brain, due to the electrical forces that she controls and that it prevented anyone from doing any deeper probes. Considering Storm wasn't trying to resist her friend, it stands to reason that this power is always active. This was also used in Worlds Apart, when The Shadow King was unable to enter her mind due to the electrical forces that she controls. 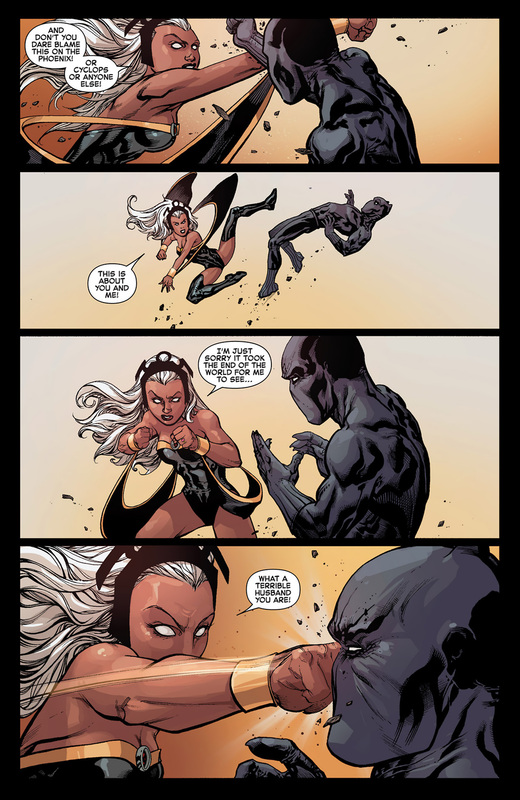 This had given Storm the advantage of preventing him from discovering her plans when she made a deal with the Goddess Bast, for her to hide within Ororo's mind and consume the Shadow King when he tried to enter. It also stands to reason that Storm has somehow been able to control this ability to some degree, considering she was able to trick the Shadow King into entering her mind at the conclusion of their battle. Her third and final defensive ability towards telepathy also involve her electrical abilities. This was also revealed in X-Treme X-men, when Xavier attempted to have a meeting with an angry Ororo in his astral form. Who's emotions were out of control, causing a powerful electrical storm. Xavier notes that Ororo's lightning was causing him pain, and that he was barely able to even maintain communication with her under normal circumstances. This was also an indirect occurrence that only recently had shown to be the case. After a battle with Bogan, who was utilizing Rachel as his slave in an astral form, Storm allowed him to enter her mind before hitting the astral form directly with lightning, destroying it. This is good indication that Storm's electrical abilities have a direct and painful affect on psionic energy and telepaths in general. She has created a lightning field to block Rachel completely as well. This can also be applied to Telekinesis, considering both run off of the same energy systems. Storm has blocked both Candra(whom she beat in a duel), after deflecting her psionic bolts with lightning and blasting her continuously until she tore through her defenses. She has also calmed and blocked Psylocke's telekinesis when she lost control for a short period. Lol you know I'm no good with deadlines. We learned from the bad days! Well damn. They didn't have an uploader here?Yeesh. Glad I wasn't here for that. I would of left!